This year’s Ultimate Gift is obvious for anyone who follows Unclutterer on Twitter or readers who have been with us since roughly this time last year, but it might take the rest of you by surprise. 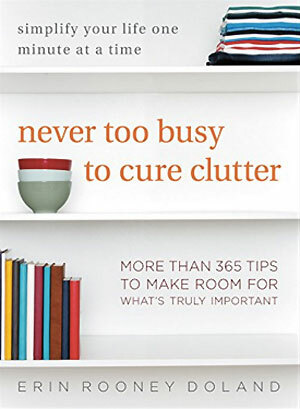 This year’s selection is Never Too Busy to Cure Clutter the next organizing, cleaning, and uncluttering book by me, Unclutterer’s Editor-in-Chief Erin Rooney Doland. Before I say anything more, I want to start by thanking all of our awesome Unclutterer readers because without you this project wouldn’t exist. After years of reading your emails and comments, I noticed that being busy is a huge obstacle to becoming more organized and dealing with clutter for so many people (myself included). I wrote Never Too Busy to Cure Clutter in such a way that if you only have 30 seconds, 1 minute, 5 minutes, or (if you’re lucky) 15 minutes, you can find a task that works with the time you have available. If you order Never Too Busy to Cure Clutter online before it is available in stores January 26, I will e-mail you a bonus chapter for free, as a special bonus. 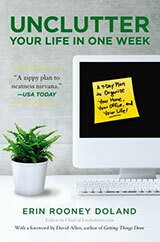 The chapter is about resolution and goal setting and provides concrete strategies for helping to achieve your goals. All you need to do is simply fill out the form to redeem your bonus chapter. For those of you who have already ordered the book, feel welcome to fill out the form to get your bonus chapter. All chapters will be e-mailed starting on Monday, November 30. I have decided to do this promotion on the honor system. I am trusting you and taking your word for it that you ordered the book. And, along those same lines of the honor system, I’m also requesting that no one posts this chapter online after you receive it. I want to offer something special just for Unclutterer readers, so I hope that you respect my requests. This is a limited offer and it will disappear the night of December 16 from the website. Between now and January 26, I’ll be sharing some of the book’s content on the site and answering your questions about the book (for example: yes, there is a digital version of the book if you want to read it on your Kindle or other e-reader and the book is being published by William Morrow, a division of HarperCollins, so you will be able to find it through most major retailers in the US, Canada, and the UK). For obvious reasons, I think this book will make a terrific gift for you and everyone in your life because I know you’re all busy. And, it will be delivered at a time when the madness of the holidays is over and people can actually open it up and find something to do right now. You can learn even more about the content of Never Too Busy to Cure Clutter on the page I’ve created for it on the site. Also, the book is gorgeous — the designers at William Morrow are geniuses. Thank you, again, for being such wonderful readers and making all of this possible and I hope you all enjoy and benefit from the content of the text.